If you've just checked our blog, we're playing a game on our Facebook “Media Heritage, Inc.” and “Big Broadcast” pages. This was the tenth and final quiz this time around (see all of the quizzes here). Perhaps we'll do this again in the future. Have an idea for something you’d like to see? Let us know. This photo is, perhaps, a bit tricky because it is an image of Fibber McGee and Molly actress Marian Jordan dressed up as the “little girl” character “Teeny.” It was released as part of the publicity for the 1937 RKO film, “This Way Please.” The character of Teeny was a popular “second banana” on Fibber and one of several that Marian, a.k.a., “Molly McGee” portrayed during the nearly 20-year run of the show. Teeny first appeared on the October 14, 1936 episode, about six months after Fibber debuted. The character sang “Animal Crackers in my Soup,” to capitalize on another cute child star of the day—Shirley Temple. During the Christmas season of 1942, Teeny sang “Twas' the Night Before Christmas” with the Kings Men singers and the rendition was so popular, a boxed set of 78 recordings were sold to the public and became big sellers. In 1948, Teeny divulged that her “real” name was “Elizabeth,” she mentioned also that her boyfriend was Willie Toops and that she had a dog named Margaret. Teeny's key catchphrases included “I know it!” and “I'm hungry!” and she was rather keen in her ability to get Fibber to cough up a nickel or dime now and then. For Marian's part, voicing Teeny was a bit of a vocal trick and, although occasionally Molly and Teeny would be in the same scene at the same time, usually Teeny showed up after Molly “left the room” in order to ease the vocal strain of doing the falsetto voice. 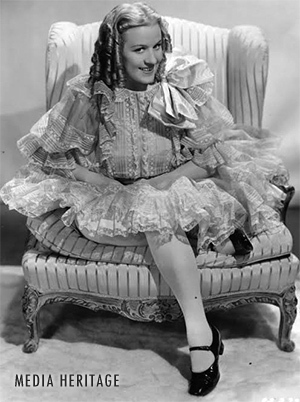 When Marian temporarily retired from the show in 1937 through all of 1938 while she recovered from an undisclosed illness, Teeny continued to receive fan mail in absentia. Also, it might be interesting to mention that Marian usually did her parts on Fibber while sitting at a table on the left side of the stage while husband Jim Jordan stood at the center stage microphone at the NBC studios in Hollywood. For the 1953 season, as radio's Golden Age began to fade out, Fibber McGee and Molly was changed to a daily 15-minute program. No longer permitted to have a studio audience or a large cast of secondary actors, Teeny actually had more of a presence on the show. The character also appeared with Fibber and Molly when they appeared on the NBC weekend Monitor program. Marian Jordan became noticeably ill in 1960 and she was diagnosed with ovarian cancer. She passed away on April 7, 1961. Oh, and this photo? Even though it was a publicity shot for the movie “This Way Please,” there was no actual scene in the movie in which Teeny appeared.